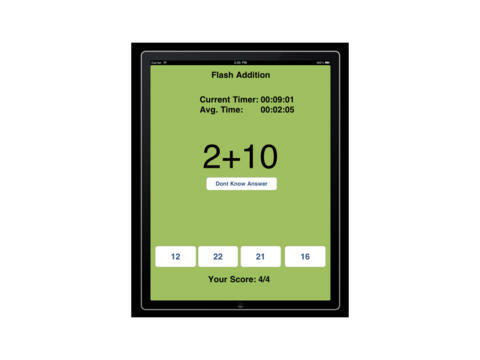 Flash Add is an app that will help learning addition be fun. This app teaches 0 to 15 additions and gives you how long it is taking you to complete each question and how many you have correct. Test yourself with time and speed! Simply choose the answer from the list of answers and your score will automatically be calculated. With this app you will see your addition speed and correctness increase. Wow everyone with your addition skills and get this app!